These Advertising Flags for Outdoor Applications Provide Any Business with Custom Promotional Signs! Feather Banners Help Draw More Interest and Exposure to Commercial Locations! Set Up Advertising Flags at Car Dealerships to Entice Customers! AdvertisingBannerFlags.com has partnered with one of the world's leading outdoor fabric advertising flag silkscreen printers based in Europe. These advertising flags utilize the best of both worlds. The four color silk screening process feather banners with continuous colors are available at lower costs than digital prints. These advertising flags undergo a specialized four color silk screen process that enables full color images to be produced. These flying banners, or promotional signs, are manufactured from white knitted polyester with hemmed seams. 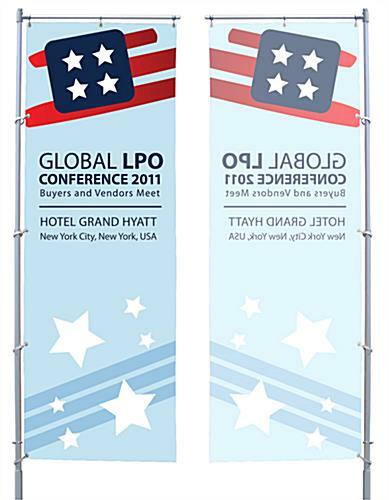 The hemmed seams prevent fraying of the advertising flags over time. Furthermore, white edge reinforcement is sewn onto one side and the top of the signs to keep the grommets from yanking out.